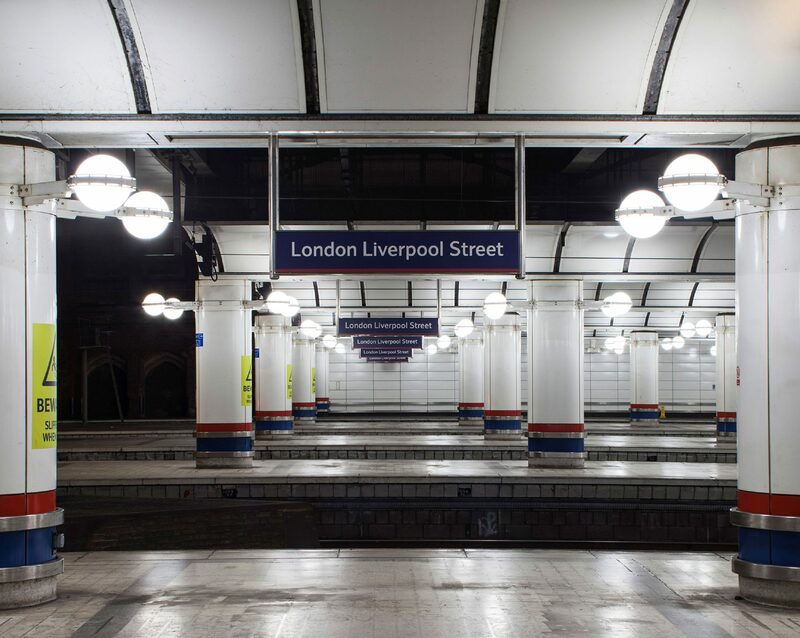 LED Eco Lights has announced that Network Rail has fitted its Goodlight LED lighting into all 18 platforms and the concourse at London’s Liverpool Street Station, Britain’s third-busiest station with over 66 million passengers annually. According to the company, passengers and staff are benefitting from better quality lighting and at the same time Network Rail is seeing a significant saving in electricity costs and a reduction in its carbon footprint. The Goodlight LED lamps can be retro-fitted into the existing fittings, allowing the relamping to proceed with little disruption. Over 3,500 lights were replaced by two teams of two operatives. They worked from two scissor lifts on a permanent night shift during the five-hour window offered by station closing hours over a six-month period. Some commuters shared tweets about the improvement and many of the staff that work at the station expressed appreciation for the improved station environment. 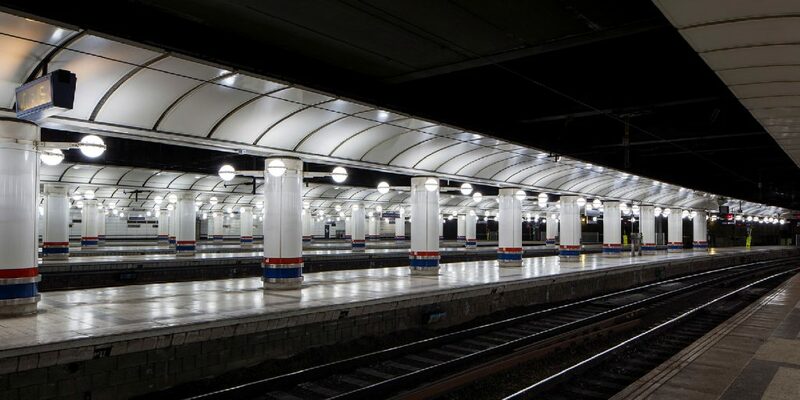 According to LED Eco Lights, Liverpool Street Station is seeing both an increase in light levels and a reduction in energy demand following the relamping with Goodlight LED. The station has measured an increase in lux levels on the platforms and concourse, from approximately 75 lux with the old lighting to 210 lux with Goodlight. At the same time, there has been a temperature drop of approximately 40 degrees centigrade at the exterior of the globe fixtures, which should improve reliability as well as efficiency. 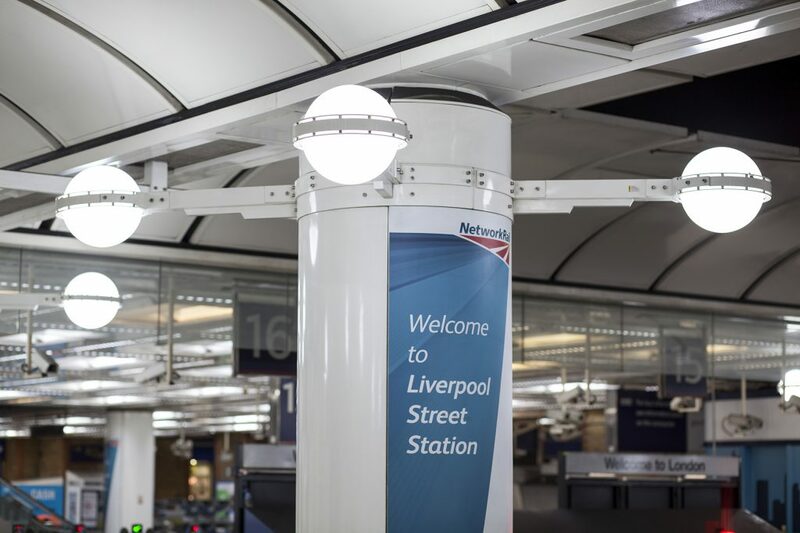 During the replacement of the concourse lighting in particular, maintenance teams noticed that there was a lot of the discolouration around the lamps and reflectors caused by heat produced by the old fluorescent lamps and control gear. This illustrates both the amount of waste heat generated and the issues it was causing. LED Eco Lights says the energy saving from the new lights is over 800,000 kWh per year from the platform globe fixtures alone. Adam Thackeray estimates that the new LED lighting uses about half the energy of the old lights, and will pay for itself in just 12-18 months.